Supposedly, Mike Glennon was a tailor-made fit for Mike Sullivan’s offense, the same offense that was ranked ninth in the NFL in 2012 with Josh Freeman in charge. Greg Schiano thought Glennon was the right man, but Glennon captained the NFL’s worst offense last season. 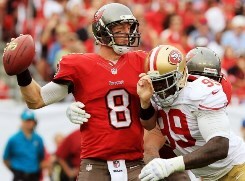 Don’t worry, says former Bucs quarterback Jeff Garcia. 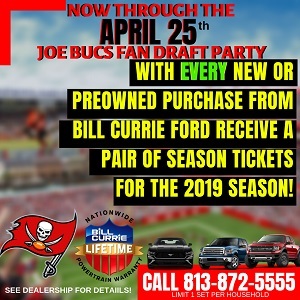 Sharing his thoughts via Twitter, Garcia, the last quarterback to lead the Bucs to a division title, shot a note to a fan that included a gentle endorsement of Mike Glennon and proclaimed that life will be better under new offensive coordinator Jeff Tedford. Joe would love to know why Garcia believes Tedford’s system will be better than Mike Sullivan’s. Perhaps Garcia believes things can’t get any worse? Joe doesn’t mean to be a wiseass. It’s just that nobody knows what Tedford’s offense is going to look like. Tedford also is the kind of offensive mind that surely will tailor his system to his starting quarterback’s strengths, and the Bucs don’t know who their starter will be. They’ve yet to publicly hand the job to Glennon. As for Garcia hyping San Jose State QB David Fales, keep in mind Garcia played for San Jose State and has a personal relationship with Fales, who thrived in San Jose State’s west coast offense and spent his freshman season at the University of Nevada marveling at the work ethic of Colin Kaepernick. Fales grew up in Tedford’s general neighborhood, so perhaps there’s some history there, maybe enough to knowledge to make him extra attractive in the late rounds of the draft. Have no fear, the best Buccaneer QB since Jeff Garcia is here. He is wearing #8, and going into his 14th career start. If not for Glennon’s marginal success last year, then we could be tempted to reach and draft a QB. No way we TRADE UP, and then REAH on a QB. No QB coming out that is “best option to win” over Glennon. Conventional wisdom says “no” to Glennon and no to the mix bag scouting report on Fales. I really hate this part of the year because every one has on their draft expert hat and offers what they think is the answer to draft needs. There is no perfect science to the draft and it’s not truly a great move until your money or job is on the line. So whomever Tedford picks will be calculated and there will be some risks acceptance involved! got a big LOL right there. what about the same offense that had muscle hamster lighting it up? what about the same offense, only with with an OL that could not block their way aout of a paper bag? What about the same offense except losing a HOF tight end? what about……ah, ta hell with it. it’s all Glennons fault. Some say he will get better, some say he is not enough. What ever. But once again Joe gets his comments in to question the QB position. It’s pointless because the GM and Head coach have the options and will make those choices when the time comes. I’m sure they don’t loose sleep about Joe’s comment. But in the mean time……Keep questioning the QB spot. Stir the pile. If we got a QB in the draft, joe would make comments about the DE lacking or some other position. What ever happens, Joe will stir the situation to address lack of something somewhere. Sorry Joe, but you can’t have everything. Hasn’t stopped anyone here from twerking for Manziel everyday. @Oil – spot on my brother. Well played. Freeman had a line that could actually block, D Mart and Mike Williams too. No one had film on Sulllivan’s scheme to break down either. Glennon had Freebag, MRSA, vote rigging and a locker room filled with strife. Forget the draft! The Bucs are about to trash one of the best logos in football (and out date a portion of my wardrobe)! Exactly Robert…. Freeman was bailed out by a consistently good running game and remarkable receptions by Jackson and Williams. And I didn’t see Glennon tossing four picks in a game. Or pouting when his receiver didn’t run the correct option rout. and Joe, we’ve got a basic idea of Tedford’s style and system. A lot of inside draws or quick tosses outside… A good number of middle screens as well as bubble screens and sweeps/end around. Topped off by the opportunistic shots down the sideline. Speed in space. And Glennon will be able to make quick decisions and get the ball out fast. I actually feel it’s a very quarterback friendly system which is why his college guys put up such good numbers, and the main reason why I don’t feel it’s worth the investment of targeting a QB in the first round. The assumption that Glennon will benefit from Tedford’s system is just as crazy as assuming the Johnny Football’s talents will translate to the NFL. Joe,you were all for Freeman and look how that turned out!Maybe Glennon is our man.Tired of hearing how bad Glennon is,you gave freeman 5 years,why not give mike 2. Not everybody thinks Glennon is a sack of potatoes. The QB ranked at #18 may come as a surprise to some of you. I’m neutral here but for the naysayers, feel free to kill the messenger. But for anybody who might be interested, Matt Miller is a respected NFL analyst and member of the Pro Football Writers of America. I’m not a great Glennon fan, but I think we should give the guy a shot in 2014 and then go from there. Especially if we draft one of the descent QB’s available in the mid rounds. Let Glennon start and the rookie learn the system and develop and then see who the QB is. Good, very good. But I still hold to the fact you missed your opportunity today. Half the ppl on here probably have no clue. Last question, How on earth did bald headed, Bucs NFC Championship game in ’07, above average QB, Jeff Garcia hook that??? @ROBERT6: Aren’t you the infamous Glennonite? Anyways, who is the HOF TE you are referring to? That would be the first time! biff: Let’s compare apples to apples…. not Freeman’s 4th year when he set team records and had the 9th best offense in the NFL to Glennon’s rookie year with the 32nd offense in the NFL and a rookie mark of 8 games with a TD pass. I’d say the better comparison is Freeman’s rookie year in 2009 when the Bucs had the 30th ranked offense as a better comparison. You talk about the Freeman situation, MRSA, etc as distractions in Glennon’s rookie year. In Freeman’s rookie year, we had the Leftwich/McCown/Johnson QB controversy which all took a dump and eventually led to Freeman starting, we had the firing of our OC after the preseason and Olsen’s advancement as well as rookie HC Raheem Morris firing the DC and taking on a dual role. I think the circus was actually about the same. You spoke of the OL, but in 2009 we had an oft injured Jeff Faine, a very young and raw Jeremy Zuttah at LG and the always horrible Trueblood at RT. We didn’t take as many sacks in 09 as we did in 13, probably due to the fact that Freeman and Johnson scrambled for a combined 300+ yards that year, something Glennon isn’t capable of. Discounting Martin and Williams in 2012, which Glennon wasn’t able to take advantage of last year, Freeman had Cadillac Williams returning from injury for his best season since his rookie year and Earnest Graham. Not bad at all, except Caddy’s best performance was one game at 129 yards when Freeman was QB and no others above 100. Glennon had Rainey hit 163 and 127 and James hit 158. Seems like Glennon had better rushing efforts his rookie year than Freeman in his. Then on to WR. Let’s include TE. Our leading WR in 09 was our TE Winslow with 77 receptions, VJ led last year with 78 receptions. The difference is in yards where VJ outdid Winslow by about 340 yards and 2 TDs. The #2 receivers were Antonio Bryant (oft injured 39/600/4TD) vs Tim Wright (54/571/5TD). After that we had Stroughter/Stovall/Clayton/Stevens in 09 vs Underwood/Owuse/Dawson/Crabtree. Only thing that stands out there is how Underwood had 4 TD while the group of 4 from 09 combined for 4 TD. Now, both teams were bad, had a circus year, poorly coached. 32nd in offense in 2013 vs 30th in 2009. But let’s take this a step further. Let’s move to 2010 for Freeman, because we know how he turned out which is why we are in this conundrum. 2010 wasn’t much different with the O-line, a mad shuffle of Zuttah at G then C then G, Ted Larsen playing, Joseph hurt, James Lee taking over for Trueblood. Not pretty. Even with Blount being inactive for 3 weeks, and only starting 7 games, we got production out of him. WRs were still bad, but improving with the addition of Mike Williams and still having K2, but Benn/Stovall/Parker/Stevens was not good behind them. Defense was pretty good and we went 10-6, most thought we were on our way to improving. Now, to Glennon’s sophomore year coming up. Let’s give him the chance to be the guy. Let’s improve our defense, let’s give him a few extra weapons or maybe a better O-line to block. Let’s make him look pretty good and win 8 or 9 games but miss the playoffs. Let’s think we’re improving and “on our way”. Let’s miss out on drafting Bridgewater or Manziel (at any cost this year) and let’s play ourselves out of position to draft Mariotta, Hundley, or Winston (if he even comes out) next year. Then, with no other real options, let’s stick with Glennon another year and when we realize, no matter how much you put around him he’s just not good enough (similar to the Freeman situation in 2011 or even 2013) then maybe we can draft a QB in a mediocre draft class in 2016 (2014 and 2015 are both pretty good classes for QBs) and hope that with time he can beat out Glennon and maybe get us there within the next 5 years. Let’s not waste 3 years here. Glennon did fine considering the position he was placed in, but he’s just not good enough to be anything long term. Why not move up to get Bridgewater before we have to restock the little bit of talent we have with younger, unproven guys. How about we draft Bortles who seems to be more of a project, may need more time to adjust to the pro game, start Glennon next year, but have our guy getting groomed by Tedford now? If Bortles wins the job, we have our guy now, if he’s not ready, we have Glennon this year. I’m fine with drafting a qb and letting them compete with MG8, just not sold on using a first round pick on one unless possibly if the Bucs are able to trade back into the end of round 1 and get great value on a qb rated higher on their draft board (like they did when they picked up Martin as our rb). I personally believe when you spend a top 10 pick on a guy you want someone who can step in and contribute immediately, so the Bucs might be better off looking at other needs if they stay put at #7. What a shocker, former San Jose St. QB, Garcia, endorses Fales…bigger shocker, according to the article, the noodle armed Fales, can chuck a ball 70 yards…maybe it was a baseball that he threw, because I would guess he couldn’t throw a football 60 yards. Glennon set two NFL Rookie Records with Bad Coaching, ( maybe the Worst ) and missing his Star RB and 2 WR. F’ the QB worries in Lovies first yr ok?? SORRRY ………….I forgot you cant say F word here. Kudos to the mods. Please delete this. No Fales please…VJax will never see another deep ball if he becomes the starter. How is the anti-Glennon mob so sure he won’t be much better next year? Crystal balls?